Artificial Intelligence (AI) has the peculiar ability to simultaneously amaze, enthrall, leave us gasping and intimidate. The possibilities of AI are innumerable and they easily surpass our most artistically fecund imaginations. What all we read in science fiction novels or saw in movies like ‘The Matrix’ could someday materialize into reality. Bill Gates, the founder of Microsoft, recently said that ‘AI can be our friend’ and is good for the society. From decision-making to computing to robotics to vehicles and even cosmetics, AI has left its mark everywhere and it will usher in the grandest social engineering experiment in the history of the world. CBInsights has prepared a list of the major AI trends to follow in 2018. Let’s have a look at the 13 trends In AI that will have a huge impact in years to come. It is no more a closely guarded secret that in the future much of the labor-intensive work in assembly lines of factories would be done by AI programmed robots and not workers. This would bring down the cost of hiring workers and also reduce outsourcing and offshoring. Recently, a Chinese T-shirt manufacturer Tianyuan Garments Company signed a Memorandum of Understanding (MoU) with the Arkansas government to employ 400 workers at $14/hr at its new garment factory in Arkansas. Operations were scheduled to begin by the end of 2017. Tianyuan’s factory in Little Rock, Arkansas, will use sewing robots developed by Georgia-based startup SoftWear Automation to manufacture apparel. 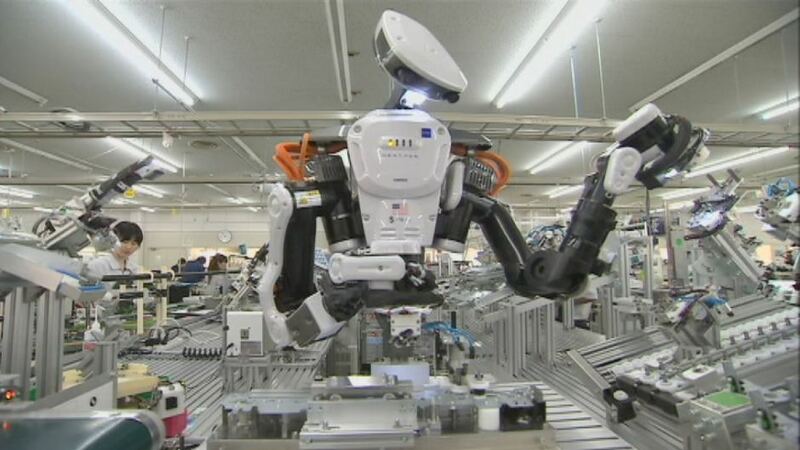 In Japan, by 2025, more than 80% of elderly care would be done by robots, not caregivers. Artificial Intelligence impacts multiple fields, even those that we least expect it to. Machine learning, a crucial component of AI, refers to the training of algorithms on large data sets so that they learn how to identify desired patterns better at their tasks. The functioning of AI is getting more versatile with each passing day. UK’s IntelligentX wants to introduce the world’s first AI brewed beer; DeepFish in Russia is using neural networks to identify fish, and Sweden’s Hoofstep is raising VC money to bring deep learning-based behavioral analysis to horses. China is all set to prove its prowess in AI and outshine the US and other western countries. The Chinese government is investing a lot in this futuristic technology. The Chinese government is promoting an intelligence plan. It includes everything from smart agriculture and intelligent logistics to military applications. 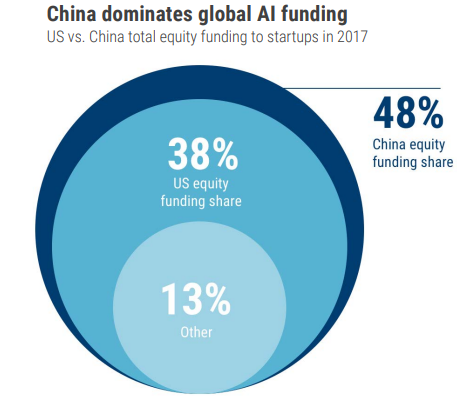 In 2017 China’s artificial intelligence startups took 48% of all dollars going to AI startups globally in, more than that of the USA. In deep learning also China publishes six times more patents than the US. 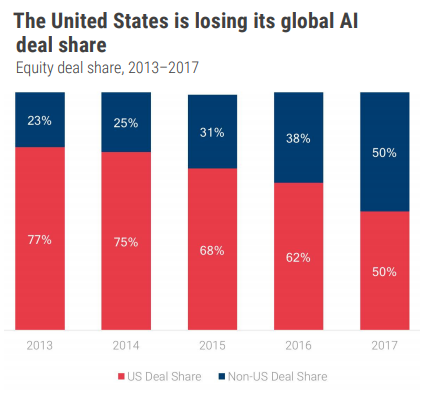 The US is also, seemingly, losing its preponderance in AI startups to China. In technologies like face recognition, China has poured in billions. In July 2017, the Chinese government said it planned to reach the level of United States in artificial intelligence by 2020 and become the world leader by 2030. One government-backed project is to create a chip that has 20 times the performance and energy efficiency of NVIDIA’s GPUs. Chinese company Cambricon is pledging to make one billion processing units in the next three years and is developing chips specifically for deep learning. The wars of the future will rely on smart technology like never before. Drones are just the beginning. With the increasing convergence of conventional defense, surveillance, and reconnaissance with cybersecurity, the need for algorithm-based AI only expands. Cybersecurity is a real opportunity area for AI since attacks are constantly-evolving and the main challenge is new forms of malware. Prima facie, AI would have an extra edge here given its ability to operate at scale and sift through millions of incidents to identify aberrations, risks, and signals of future threats. The market is mushrooming with new cybersecurity companies trying to leverage machine learning to some extent. A total of 134 startups have raised $3.65B in equity funding in the last 5 years. About 34 of them raised equity for the first time last year to compete in a market still dominated by larger companies like Cybereason, CrowdStrike, Cylance, and Tanium. Voice-enabled computing was all over at the Consumer Electronics Show in 2018. Barely any IoT device was without integration into the Amazon Echo or Google Home. Samsung is also working on its own voice assistant, Bixby. It wants all of its products to be internet-connected and have intelligence from Bixby by 2020. LG made all of its appliances in 2017 WiFi-enabled. Skilled professionals — including lawyers, consultants, financial advisors etc —will face the heat of artificial intelligence as much as unskilled and semi-skilled workers. For instance, artificial intelligence has huge potential to reduce the time and improve efficiency in legal work. As AI platforms become more efficient, affordable and commercialized, this will influence the remuneration structure of external law firms that charge by the hour. Artificial Intelligence isn’t only limited to powerful supercomputers and big devices; it is also becoming a part and parcel of smartphones and wearable devices and equipment. 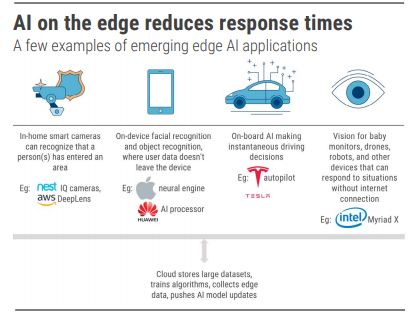 Edge computing is emerging as the next big area in AI. Apple released its A11 chip with a neural engine for iPhone 8 and X. Apple claims it can perform machine learning tasks at up to 600B operations per second. Another case for edge AI would be training your personal AI assistant locally on your device to recognize your unique accent or identify faces. Neural networks have myriad architectures. One of the most popular one in deep learning these days is known as convolutional neural networks. Now a new architecture, capsule networks, has been developed and it would outpace the convolutional neural networks (CNNs) on multiple fronts. CNNs have certain limitations that lead to lack of performance or gaps in security. Capsule Networks would allow AIs to identify general patterns with less data and be less susceptible to false results. Capsule Networks would take relative positions and orientation of an object into consideration without needing to be trained exhaustively on variations. As per a recent report, the approximate number of qualified researchers currently in the field of AI is 300,000, including students in relevant research areas. Meanwhile, companies require a million or more AI specialists for their engineering needs. In the US, a Glassdoor search for “artificial intelligence” shows over 32,000 jobs currently listed, with several salary ranges well into the 6 digits. Companies are more than willing to pay handsome emoluments to intelligent AI experts. Also Read: What is the difference between AI, machine learning and deep learning? As tech giants like Google, Amazon, Salesforce, and Microsoft improve their enterprise AI capability, it would be very difficult for the smaller players to sustain themselves. Google released Cloud AutoML. Customers can bring their own data to train the algorithms to suit their specific needs. Amazon began selling AI-as-a-Service with “Amazon AI” under its AWS banner. Amazon AI‘s goal is to serve big. Regulators in the US are looking forward at approving AI for use in clinical settings. The advantage of AI in diagnostics is early detection and better accuracy. Machine learning algorithms can compare a medical image with those of millions of other patients, picking up on nuances that a human eye may otherwise miss. Consumer-focused AI monitoring tools like SkinVision — which uses computer vision to monitor suspicious skin boils — are already in use. 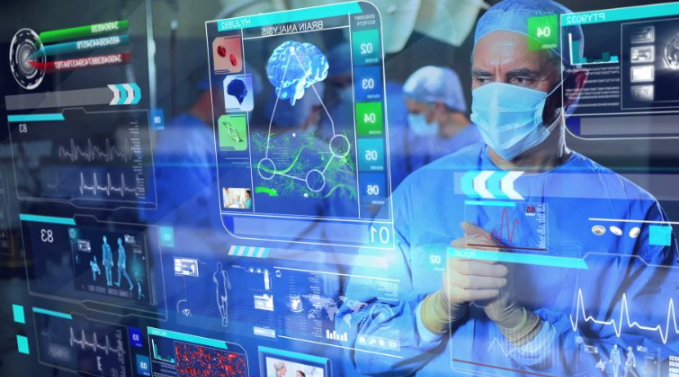 But a new wave of healthcare AI applications will set the ground for machine learning capabilities in hospitals and clinics. Recently, AstraZeneca, an Anglo–Swedish pharmaceutical and biopharmaceutical company, declared a partnership with Alibaba subsidiary Ali Health to develop AI-assisted screening and diagnostics applications in China. GE and Nvidia have also joined hands to bring deep learning capabilities to GE’s medical imaging devices. Because of open source software libraries, hundreds of APIs and SDKs, and easy assembly kits from Amazon and Google, the barrier to entry in AI could not have been lower. Google launched an “AI for all ages” project called AIY (artificial Intelligence yourself). Its first product was a voice recognition kit for Raspberry Pi that enabled the users to give any voice they desired to their personal voice assistant. Point of no return for Machine Learning? First was big data, and then came cloud, then the machine learning frenzy. We reached peak machine learning in 2017. Last year investors pumped in over $15.2B in funding to AI startups across multiple industries. It was a 141% spike in funding from 2016. 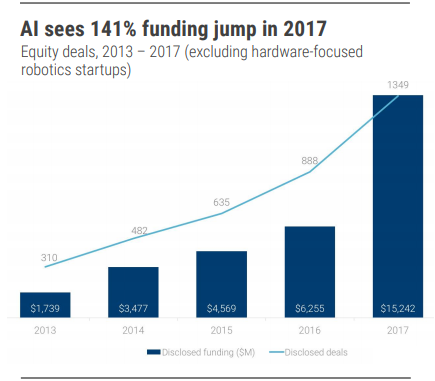 Over 1,100 new AI companies have raised their first rounds of funding since 2016. And that’s more than half the historic number of AI startups that have ever raised an equity round. The normalization and mainstreaming of machine learning will make investors picky about the AI companies they fund.